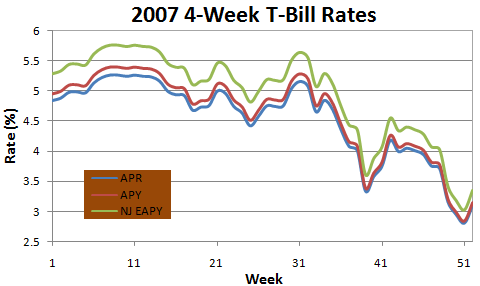 When 2007 began, the rates of the 4-week T-bill were very attractive, with returns as high as 5.4% APY. Before FNBO Direct launched their 6.0% APY promotional rate early last year, 4-week T-bills were my main short-term investment vehicle for the good returns and automatic investments that were very easy to manage. However, things started to turn ugly in the summer and the interest rates couldn’t keep pace with major online banks. When the current cycle of rate reductions began, the 4-week T-bill’s rate just kept dropping like a rock, at a much faster speed than online banks lowering their interest rates. When 2007 ended, the investment rate of 4-week T-bills barely stayed above 3.0% APR level. I dumped our investments in T-bills in early June and am glad I did. Now with the Fed expected to cut its benchmark interest rate again late this month, yields of online savings accounts will move lower. Pretty soon, 5.0+% APY will become history (check out the latest bank offers and you will see only a few banks still have yields above 5.0%). I wonder what the alternatives are in order to get good returns with flexible withdraw policies. I would LOVE to be earning 5% on T-bills now. Here is the list of losers that stole the taxpayers money and are responsible for the abysmal rates now. They should be in prison for committing extortion against our economy.